I’ve been so miserable today. I’ve felt worse than I did yesterday. Both my cold and the cough has been worse today. 😦 Yesterday I actually felt much better so waking up today and noticing the opposite was no fun at all! I went home one hour earlier today in order to rest and take it easy. On my way home I stopped at the grocery store and bought a few things I thought might cheer me up. 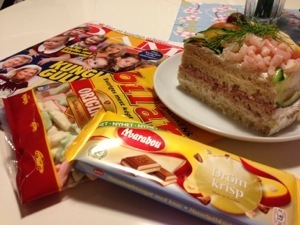 I bought a piece of a sandwich cake for dinner, two types of candy and a gossip magazine so I could catch up on the royal news. Can’t say all this made me feel any better but I gotta try! Oh blah. I recommend you take at least a further week off work and stay in bed with your gossip magazine, a lovely big glass of water and the tv remote close at hand. xo I hope you are feeling better soon, my friend!